Reliable, tough and resilient BALLISTICS grade polymer. Retains its shape, ensures long & effective lifetime service. Fits all makes of pallet racking. 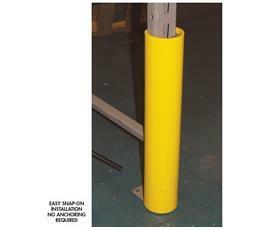 Cost effective protection for your racking. Reduces racking damage by as much as 80% saving Time, Trouble and Money. Easy snap-on installation, fits in seconds, no tools or anchoring required. Virtually unbreakable in temperatures above 41° F. Operates down to -40° F. Impervious to moisture, mold growth, corrosion, acid, alkaline and most solvents. High visibility color with other colors available - quantity sensitive. Fully recyclable and non toxic. Made in USA. FOB Shipping Point. Guards are price quantity sensitive. Call for pricing for more than 100 guards.